Perhaps you've seen our coat rack in previous posts. It's made with the same principle as the DIY branche clothing rack. Making this one is even easyer. You'll need a tube, two hooks and a metal cable. Put the cable through the tube and hang it onto the ceiling and you're done. We have this one hanging in our hallway, it's perfect for tiny Dutch homes where every space needs to be used as efficiently as possible; underneath we can put shoes, umbrellas and bags. I like to put different kinds of hangers on it, a couple of leather studded hangers from the 1980's, a few metal ones from IKEA and a couple of very thin ones from metal wire. 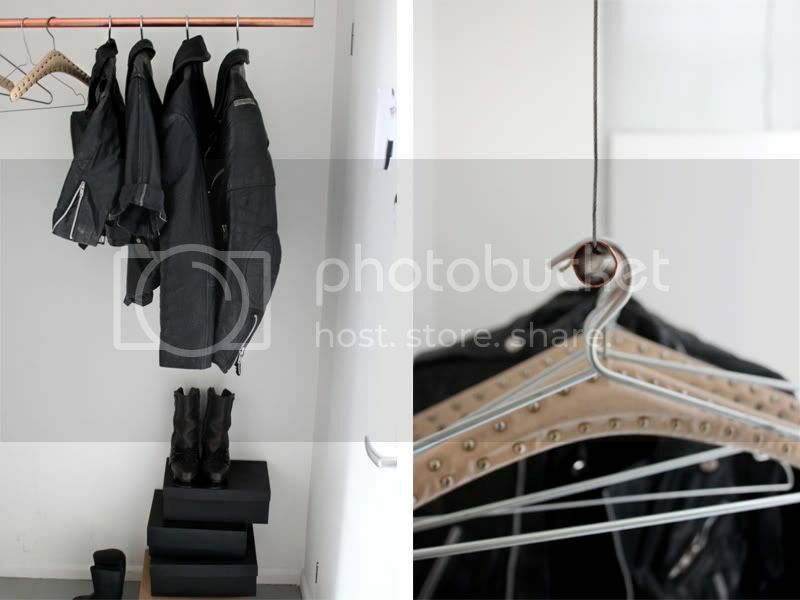 i love the way you organize your clothes:) simple but cool. Leuk idee zeg! En je jasjes zijn zó mooi! Wow, that's a good one. If I had the room I'd try it! Ik vind het echt heel mooi staan, en ook een super lichte ruimte! Gorgeous :)! Leuke blog btw, ik ga je volgen. you are brilliant. enough said! ziet er echt mooi uit! The hardware detail makes closet storage look so good! Oh wow, so simple for such a slick, cool looking piece. Love the biker jackets, by the way. Cool and easy DIY! Thanks for the tip! your blog is just sooo amazing, I love your style!!! Zo leuk gedaan weer! Jouw blog is mijn lievelings! Thank you for your lovely comment :) I think you should become interior designer or furniture designer, it's not like you arent already! :D I really hope you win this blogger's wardrobe competition, because you are by far the best blogger among them. So much quality and great style, seriously! I've been wanting one of those clothing racks for a long time! Thanks for the tip :) and - you've got a nice collection of leather jackets there! DIY apt. posts, I need to redo my apartment. So your blog is AMAZING and totally inspirational. I'm following you now and am so excited to see what you post next! And I like your blog too! I'm following now! Enter my current giveaway :)! There are two beautiful cocktail rings to win :)! i like the clean aesthetic in this space and wardrobe. everything seems to have a place, a purpose. no frills. anserw: oh , no that´s not okey to do. I would never steal from other blogs. I must admit that I'm not good at english hehe. But I can tell her to stop stealing from you! I re-did my room in Canada last year and tried to do that but my ceiling nearly caved in with the weight of the clothes so I tried to do the same thing by bolting the rack to the wall and painting everything black which kind of gave the same effect. I love your blog by the way. This is such a good idea! I remember your DIY branch page because that was the post that first brought me to your blog a while ago! I can't decide which one I like better, this one or the branch! With the help of this blog,I am able to learn lot of things. Beautiful ideas are being mentioned over here. Few hangers and a hanging stick with wire fitted to it makes your work easier. Wow! what an idea ! What a concept ! Beautiful .. Amazing Nice review! I am confused. can't decide which one i like. really never seen. Hello, I love reading through your blog, I wanted to leave a little comment to support you and wish you a good continuation. Wish you best of luck for all your best efforts. plastic baskets delhi, shopping racks manufacturer delhi. Hi there. Nice blog. You have shared useful information. Keep up the good work! This blog is really interesting and gives good details. Server Rack, Racks Manufacturer. Ivania! You got the best DIY's! I need to try this and go to a hardware shop. You live in Amsterdam right? Where do you go? Now I have to find a place to hang this clothing rack :) do you have an answer for that too? Hello, I love reading through your blog, I wanted to leave a little comment to support you and wish you a good continuation. Wish you best of luck for all your best efforts. Racks Manufacturer in Delhi, CNC Turret Punching Job Work. I tryed it but clothes were too heavy and the hooks fell out... Any suggestions??? Great idea! and love your lather jacket. Hi, lovley haninger, I was thinking about the same in my closet and this is a really good idea! I hope you dont mind me borrowing this pic for my blog, I will link back to you! Those looking for an economical option find that plastic hangers fulfill their needs. Cedar hangers protect and refresh by absorbing moisture and odors and maintain garment shape at the same time and are also natural pest repellants. This is a great article. I am a huge fashion guy and I love all sorts of clothing. I buy all different types of clothes because I love to try new things. However, I am running out of space for my clothes in my closet because I never like to throw away stuff. I noticed you hang a lot of your clothes on a clothes rack. It looks like they provide a lot of space for extra clothing, especially nice shirts and suites. 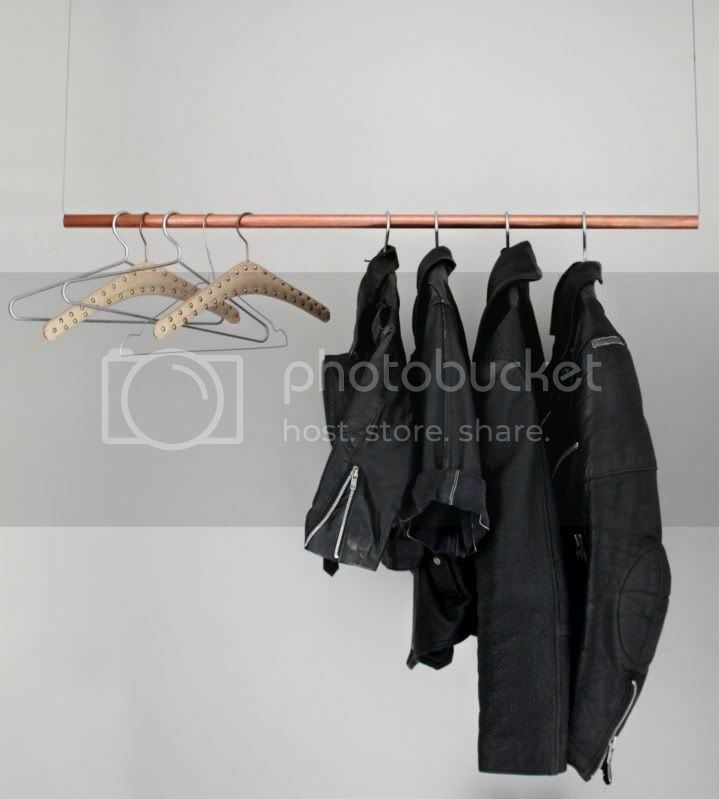 I also like how you have your other clothing accessories stored on the racks. I think this would be a great option for me because it would save me a lot of space and they are portable! Thanks for the great pictures and ideas! Corner of Pallet Wood Table, Fantastic look and essential for homes to perform many work. Ik ben zeer tevreden met mijn nieuwe witte kledingrekken. Mooi en simpel! Is dit sterk genoeg voor veel zware kledingstukken (leder, denim)?? for the free bonus and one-on-one coaching. it will not be repeated. You could be eligible to get a free $300 IKEA Gift Card. میکاپ عروس برای صورت های گرد و تپل باید طوری باشد که اگر صورت گرد یا بزرگ است، برای اینکه کوچک نشان داده شود از کرم های تیره استفاده کنیم (تیره تر از رنگ پوست) و اگر صورت کوچک باشد با کرم های روشن تر از رنگ پوست استفاده کنیم. همچنین برای آرایش عروس باید برای صورت های گرد از رنگ رژ پر رنگ استفاده کنیم. چاپ بنر را میتوان پرکاربرد ترین نوع تبلیغات و اطلاع رسانی محیطی عنوان نمود. علت استفاده زیاد از چاپ بنر قیمت ارزان تر آن نسبت به سایر محصولات مشابه چاپی می باشد. از چاپ بنر بیشتر در خارج از محیط های بسته استفاده میشود(outdoor). چاپ بنر ضد آب می باشد ولی از نظر ماندگاری در برابر نور خورشید بستگی به کیفیت چاپ بنر (مرکب) و جنس خود سفره بنر دارد. بنر خام دارای سایز های 100، 150 ، 200، 250، 300 و 500 سانتی متر می باشد. بهتر است بخاطر اینکه پرت کار نداشته باشید یکی از سایز های فوق را برای چاپ بنر خود انتخاب نمایید. Install Tutuapp iOS 12 on non jailbroken device. Tutuapp is a popular App Store like the platform to download and install games or apps for free. Install the app on iPhone, iPad, iPod Touch. Sign paid apps and hacked apps on iOS. The AppStore alternative is also available for Android devices. The software doesn't require Jailbreak or Apple ID to work. The App Store offers access to millions of apps, including paid, hacked games, and ++ applications with additional features. View apps by categories, ranking or newly added positions. The platform for iOS is absolutely safe to use and it doesn't install any malware on your iPhone or iPad. Moreover, Tutu app doesn't spy your activity or install suspicious apps. You can install the app without a negative effect on the iOS system. Installing the iOS AppStore is legal, but the app offers access to paid apps and games from App Store. It is illegal to install premium apps using 3rd party software like Tutu app if the software license disallows it.